While talks continue to find a way to keep this site going, I will continue to produce a weekly column. There is no opening piece this week as that is the most time-consuming part of putting the column together. 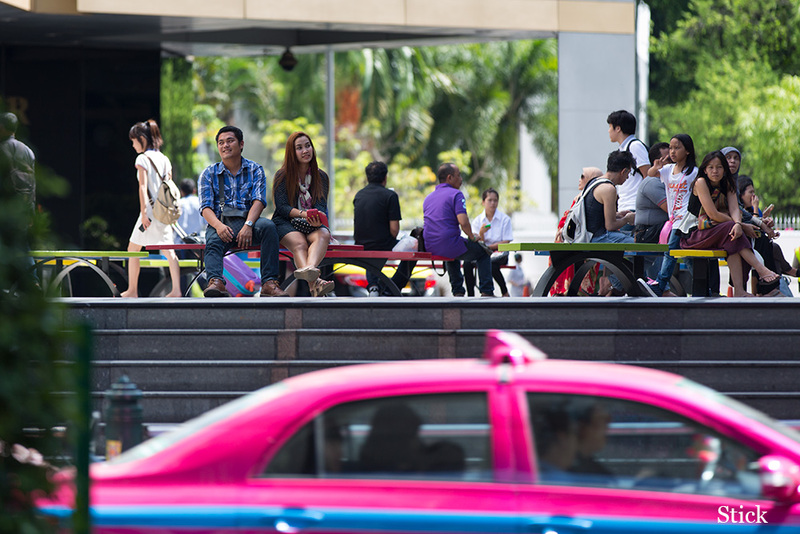 Last week’s photo was taken outside Siam Discovery Centre in the Siam Square area. It was taken a few years ago and I think the area may look a little different now, so don’t be too hard on yourself if you didn’t recognise the area. Money troubles = bitter expats. I think the situation of expats in Thailand reflects trends that are topical in the west right now. For those who are go-getters, self-disciplined, focused and well-educated with the ability to earn good money or are already rich, almost anywhere is a viable proposition. It seems to me however that the bitterness and disillusion of many expats is a function of their reduced means and status. There must be many expats in Thailand who moved there 15 or more years ago when they got twice as many baht for their pounds, for example, and baht prices were half what they are now. Modest income or wealth could be arbitraged by favourable exchange rates and low costs to achieve a living standard impossible in the west. These guys are now under financial pressure and years older – life is not as fun as it once was. However, they have committed to Thailand. How practical would a move back to their home countries be? How would they pay their way? Another vulnerable group it seems to me are the young guys who have had enough of the unforgiving, claustrophobic and ossified west and are chancing it in Asia. The tougher, cleverer realists will succeed but I wonder how many others will scrape by in Thailand, complacent, dissolute and wasting the prime years of their lives. They will face a harsh awakening in middle age. You are not even a second-class citizen in Thailand; you are nothing at all, really. Your status is totally contingent on the assessment of your monetary value to the Thai economy. It is a very vulnerable position where the Thais hold all the cards and maintain the legal framework to keep it that way. The benefits of grey hair. One of the few blessings that comes with grey (going to silver) hair and arthritis (walking with a cane) is that Suvarnabhumi Immigration routinely waves me to the Priority Lane, which normally only takes a few minutes. I still have to suppress the urge to laugh when I see the vast expanse of unmanned Immigration booths when my usual flight gets in near midnight. The Walking Street signage is safe. I made the quick trip to Pattaya to check out the Walking Street situation. I doubt very much that they will be requiring all the overhanging signs to be removed / relocated. First, all the signs that overhang the street are at least 30 feet above street level, and would not be an obstruction to firetrucks. Second, the entire sea-side of Walking Street is supplied electricity and telephone services by overhead wiring which is lower than the signs. Should the city continue with the ‘firetruck’ excuse, they would have a major PEA – TOT project to contend with first. Easier to continue than start again. The discontinuation of your column seems likely. Probably this course of events had to be expected given your very understandable and long expressed disenchantment with “the industry”. Already in 2005, I wondered if you would go on publishing for very long given the changes in Thailand, especially the fast westernization with a bias to all that is bad in the West, while failing to copy the good things. After a few incredibly great travels to Thailand I moved there in 2004, aged 28, with the intention of staying forever. Economically I could have, albeit just on a teacher’s salary. I also learned the language which I still find beautiful. But after 8 months I returned home for good as I saw how quickly the Thailand I initially loved had deteriorated. I met my (Chinese) wife in Thailand and we have wonderful children, so I certainly do not regret going there. I continued reading your column every week, hence your writing became much more intriguing than its actual subject which easily explains why your column continued to work well after you left Thailand: what you write mostly comes from within you, not from the place where you dwelled. And maybe from the past, from what Thailand once was is kept alive by your and your readers’ articles. Should you have a chance to continue Stickman in a way that is good for you, it would probably be advisable to take that chance. You are very gifted, but even so the odds might be against you for creating something large and relevant like Stickman again. You would need to find a topic which deserves your skills and it takes enormous amounts of time and effort to recreate something like your site. In addition it seems that the rules of the internet have changed. It is even more difficult than in the past to be noticed “only” because of good content. It appears that social networking has trapped people’s intention which means that you cannot avoid the big American tech companies who reap most of the fruits of everything created under their control. Stickman on the other hand appears to have a large, focused reader base. Probably this can be monetized much better, though of course such monetization may not be enjoyable. It is, however, much easier than starting over from zero and in hostile environments such as Facebook, Twitter and the like. On Tuesday night Nana Plaza was closed at 1 AM by the army. Soi 11 was closed even earlier. Curtailing the revelry happened only on Tuesday night which begs the question of why? I imagine the reason for bars and other establishments being closed early on Tuesday night was probably something along the line of some bigwigs visiting the area so the local constabulary closed things early on the pretense that that is the usual closing time which, of course, it is not. Down in Soi Cowboy, as early as 7:15 PM last night the band at 5 Star was setup and ready to party. In the past the live band hasn’t tended to get going until around 9 PM. Dollhouse has selected the girls who will represent the bar at the next Nanapong dance contest. They are very keen for one of their girls to win and have sought the advice of past judges in picking their team. With that sort of preparation, they’re taking things seriously and why shouldn’t they when there is thousands of baht at stake. As a reminder, the next official Nanapong dance contest is scheduled for Saturday, August 26, and will take place at Club Electric Blue in Patpong soi 2. The renovations at Cactus look like they are just about done. If you have not been stopped by Cactus in a while you could be forgiven for thinking you were in a different bar. The layout and colour scheme has all been changed, and the new team of dancers can only be described as an upgrade when compared to the lineups of the past. As has been previously reported, Cactus now has a playlist with songs which first hit the charts this century. Cactus has a 90 baht happy hour until 9 PM. The sign at Suzie Wong that says happy hour beers 130 baht is hardly what I’d call happy at all. When other Soi Cowboy bars promote happy hour prices in the range of 90 to 100 baht, 130 baht sounds like full price. When it comes to the price of drinks in the bar areas, I guess I must be living in the past. I hear that this was the best week on Sukhumvit in a while with bar bosses and restaurateurs all saying trade was good. When you look at the visitor arrival stats for July, it’s amazing that what is a low-season month saw more arrivals than last December, which is a high-season month! As a mate who sent me a message from the packed food court in MBK this week which he described as elbow to elbow said, “Oh how I miss when Bangkok had a low season!” You’ve got to give Thailand one thing – its stock is high and its popularity shows no signs of waning. If you stay at the Nana Hotel you can avail yourself of cheap drinks at the adjacent Strikers Sports Bar, located at the back of the car park / below the swimming pool. Presenting your room key gets you 90 baht drinks all night long – everyone else pays 130 baht after the end of happy hour. You might want to avail yourself of this special while you can as it’s hard to see Strikers staying in business with numerous reports from punters of few other patrons. I’d put that down entirely to its awkward location. Strikers has always been well-run and always had good staff but being set back from the main soi means most people just don’t see the bar. The history of the nickname The Arab goes back to Tim Randall who wrote the Baron Bonk column. As I recall, it was Tim who coined that name – and it stuck. To clarify, The Arab is originally from Iran so he is not an Arab but a Persian. He also happens to be a naturalised American citizen. None of that seems to matter and the name The Arab stuck and to this day is still used by those who talk about his bars. The Arab’s bars have been avoided by many for a long time but are the reasons to stay away still valid? Were they even valid in the old days? One column I really should have done which was suggested by a friend was a tour of the Arab’s 7 bars in Soi Cowboy, having a drink in each and writing a mini-review of each and commenting on them overall. I really should have done it….maybe I will one day. 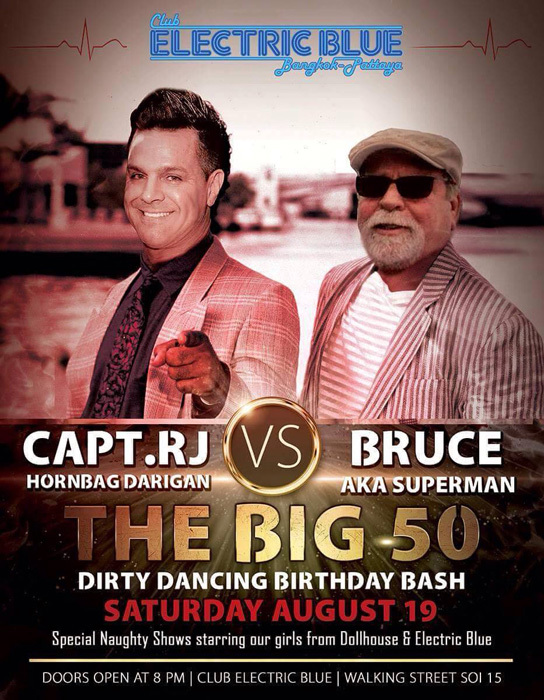 Down in Pattaya, Dollhouse will celebrate the Big 50, Captain Hornbag’s 50th birthday, the best way he knows with a big party in the bar next Saturday, August 19th. There will be a pig on the spit, free Black Crack shots and naughty shows starring dancers from Dollhouse and its sister bar Club Electric Blue Pattaya. It should be a fun night and word is that it might be like a mini-Nanapong event. Why is it that gay Westerners resident in Thailand generally speak the local language to a much higher standard than straight Westerners, and why is it that gay Thai guys (irrespective of whether they have any involvement or interaction with Western men) generally speak English to a much higher standard than your average Thai female? 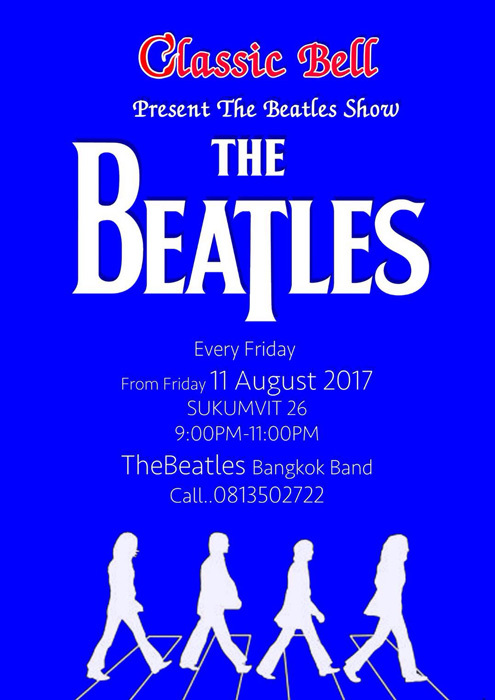 The Bangkok Beatles had nowhere to play after the closure of Flann O’Brien’s on Silom Road but they soon fixed that and from this Friday will perform at Classic Bell, a restaurant near K-Village on Sukhumvit soi 26. A few months back I made a recommendation in this column for anyone interested in watching Thai TV in the west to buy a Penta box. To recap, it’s a small box, costs just 3,500 baht, and is available at all B2S Book branches (and probably other stores too). You can watch all the main Thai television channels live, some in HD, from anywhere in the world streaming the signal over a decent internet connection. I like turning it on at midday here in New Zealand, which is 7:00 AM in Thailand, and watching the morning news on Channel 3 HD. That particular news show is a hoot and you see all the crazy stuff going on in Thailand. It’s entertaining, it’s a great way to stay in touch with what is going on in Thailand and if you have a Thai other half it will keep her happy too. The large space at the start of Sukhumvit soi 12 that was the New York Gardens (Sunrise Tacos / V8 Diner / Insanity) has been cleared and is now vacant. No, it’s not going to be an office building as we thought – and neither is it going to be a hotel. It is, in fact, going to be a 30-odd storey condo tower developed by well-known condo developer, Sansiri. Given the central location, I wonder how expensive the units will be. My best guess is that they will probably go for around 250,000 baht / square metre so a decent-sized apartment will be at least 20 million baht. It would be an ideal location for someone who is in to the nightlife as from there it’s an easy walk to each of Cowboy and Nana and even the likes of the bars in soi 22 and soi 33 aren’t far away either. And just down soi 12 from the New York Gardens, the space that was home to Darling Massage for decades has also been cleared. It looks like whatever deal was supposed to have been done has fallen through because there is now a small board erected saying that the land is for sale. The area is 534 square wah in size and the owner is seeking 1 million baht / square wah so a total of 534,000,000 baht, or around $US 16 million. 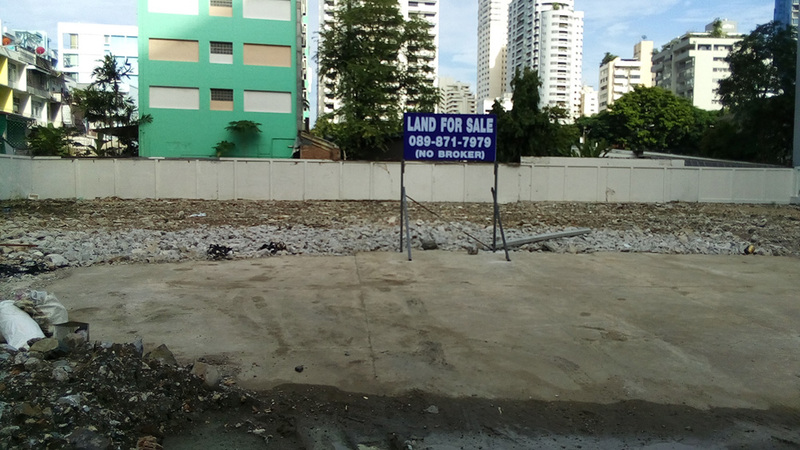 Don’t you wish you’d invested in downtown Bangkok property a few years ago?! I was offered a 100-square metre apartment on Sathorn for 2.1 million baht not long after I first moved to Bangkok. That sounded like a lot at the time, but that unit would be worth close to 20 million baht these days and is just another in a long line of bad investments I never made. They’re always the worst investments, aren’t they – the investments you never made. The space what was Darling Massage. This would have made a good where is this pic. The massively bad press the two Bangkok airports have been getting this past week after photos showed horrendously long queues at Immigration is not new. There have been complaints about long queues at Immigration at both Bangkok airports and at Phuket airport over the past few years. It should also be noted that the main land crossing border point between Thailand and Cambodia at Poi Pet is also known as a choke point and there can be very long queues with a wait of more than 2+ hours if your timing is bad. And to make matters worse, at that border point there aren’t many air-conditioning units and they do not cope when it fills with people and the building turns in to a sweatbox. Those hauling large pieces of luggage up the stairs or stuck outside will be even more uncomfortable. One big difference I notice between New Zealand and Thailand is that middle-aged men and older in NZ don’t incessantly play with their phones the way so many older Western men resident in Thailand do. Why is it that middle-aged Western guys in Thailand are always beavering away with their phone. Online dating, perhaps? Boredom? One of the things that really bothers me about Thailand is how the bad stuff doesn’t seem to change and how mistakes are seldom learned from, despite all of these so-called crackdowns which more often than not seem like they are announced so the authorities can be seen to be doing something when quite possibly they are not. Here’s an example: a mate currently on holiday in Pattaya with his family sent me a photo of the fire exit in his hotel which was completely blocked with large boxes. There is no way anyone could get out in the case of an emergency and the pile of boxes from floor to ceiling would take ages to move. In the event of a fire you’d be toast. I guess the Thais have long forgotten that in 1997 there was a famous fire in a hotel in Jomtien Beach where the exits were locked and 78 people died. Some things never change, eh?! 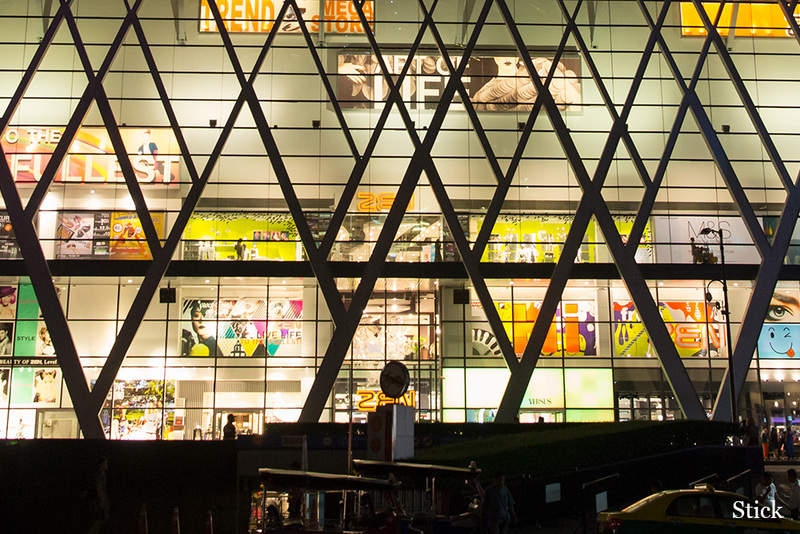 Reader’s story of the week from Bangkok Real ,”It’s My Affaire” is the best reader’s submission in a very long time! Immigration admits the delays in passengers being processed at Don Meuang Airport is due to staff shortages and the next day another article appeared which said that even at quiet times it took 30 – 60 minutes in the queue to be processed. Comments about police not being allowed to have an interest in bar or nightlife entertainment venues is a hoot given so many already have a financial interest in bars and many moonlight as security and enforcers. A government department and Khon Kaen University have launched a clinic to help Thai women married to foreigners better prepare for life abroad. A Bangkok Post editorial slams the Immigration fiasco at Don Meuang Airport before another editorial on Sunday is similarly critical of immigration processing times at Bangkok airports. Travellers face massive queues at Suwanabhum Airport where the photo in this Thai language article tells the story. The authorities bust some goons trafficking women to be sold in the Nana area of Bangkok. Question 1: I was wondering what happens in Thailand if farang “married” to Thai girl outlives her. In my case, we have done the “bush wedding” only and I have a legal will when I finally depart but what happens if she goes first? We have cars, house, bikes, etc all in her name but it is clear to all they are ours as I paid for all of them and the family knows it. If she dies tomorrow, I’m concerned certain family members might get greedy which could leave me in a very messy situation, i.e. no house, car, etc. Sunbelt Legal responds: Since you are not legally married to the Thai woman and if she has no will, that means in case something happens to her then the house, car, bike, everything in her name will automatically go to her children or in case she does not have any, to her parents or next of kin. It is best to have a legally registered marriage, which requires an affidavit of freedom to marry from your embassy before starting the process. Sunbelt Asia Legal Advisors will be happy to help you and guide you through the process. Alternatively, your wife can do a usufruct on the house which gives you the right to live there if she passes, or she can do a will which states what you would get and if it’s the land you will have one year to liquidate it. Question 2: There are a couple of very tall and very old trees in a field beside our house that present a hazard as they are in danger of falling on to the house in the strong winds we have during a storm. Workers were in the field today reaping the crop and my wife explained the problem and asked for the phone number of the owner so she could talk about removing the trees, which actually would give the owner more land for growing her crops. They totally ignored her. We made similar efforts last year and got nowhere. Would we run into any legal problems if we got the local authority to remove them, as a danger to property? Sunbelt Legal responds: We do understand your concerns regarding the large trees. You can hire workers to cut down the trees however you would need the consent of the land owner. Without it, that would be considered trespassing. The local authorities do not have the right to cut down trees unless it is on public property which in this case it is not. Sunbelt Asia Legal Advisors would suggest that instead of talking to farm workers you try to find the owner of the land. A first step would be the local village headman who should be able to guide you to the right person to ask permission to remove the trees. There were some issues accessing this site earlier today which had not been resolved when I put this week’s column up. It’s a little hard to explain but basically the problem was not at this site, but at a site which this site pulls data from, and which subsequently had an effect on this site and slowed everything down. My apologies if accessing the site was not as quick and easy as it should be.